Looking for a backpacking stove? Then the MSR MicroRocket stove is a preferred camping stove for anyone looking for lightweight cooking options. On a hiking trip, when you are counting grams, then you should seriously consider this as your stove of choice. Campers might also want to consider this, as it is reliable for a quick boil or cooking up of your dinner if you don’t have access to a fire and watching space. We have set it up in the outside vestibule of the tent, ready to brew a coffee first thing in the morning without the need to get out of our sleeping bags (note: caution always required when using any flame near tents). There are a lot of things we like about this stove, and it is one that really is perfect for campers, but hikers will love it! Handles the breeze brilliantly due to the concave burner head. Fits nicely in a mug! We use the Titan Kettle with it, but you can put other pots or kettles on the strong pot supports. MSR have put a lot of effort into making this probably the best of their stoves – with strong construction and excellent efficiency with the fuel, it outshines all our other stoves for speed and reliability. It comes with a smaller wind deflector on the MicroRocket. The stove also comes with a carry case (incredibly light) plus the Piezo igniter. Using this igniter makes lighting the stove a delight, and works each and every time. You do need to purchase the fuel separately – we recommend you stick with MSR fuel, but it will come down to budget and availability for each person. Comparison to Jetboil Flash – the MicroRocket has more options for use and is naturally lighter and a lot more compact. There is not much difference in time to boil. 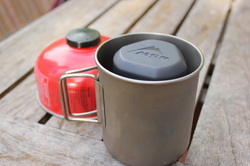 We still use our Jetboil for a quick cuppa on short hikes or car camping.